Intralipid (20% fat emulsion) is a formulation of intravenous fat made primarily of soybean oil, glycerin, and egg yolk-derived phospholipids. 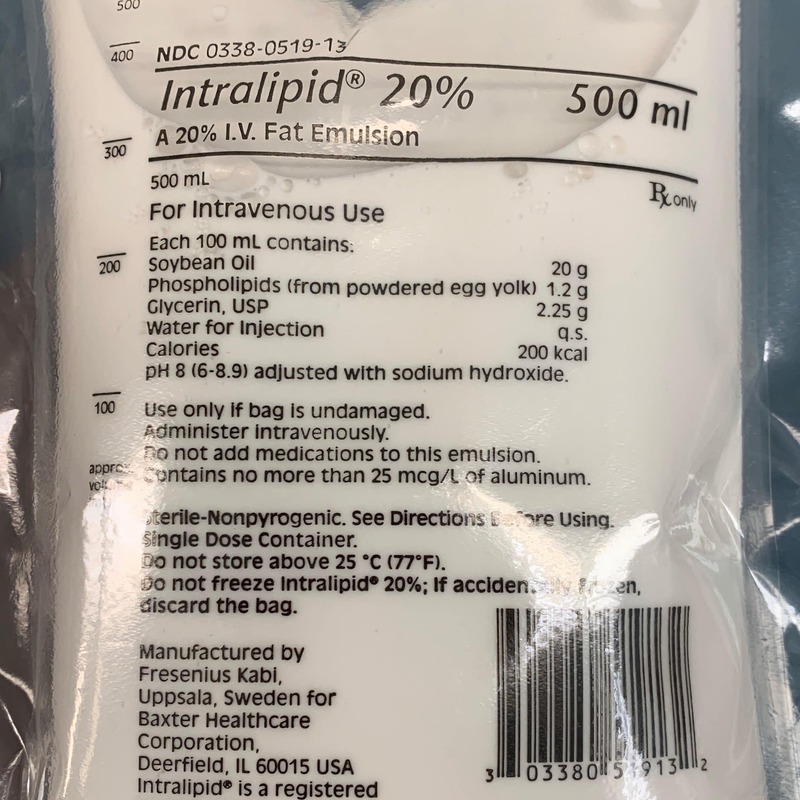 As an intensivist, Intralipid provides supplementary nutrition to patients on parenteral nutrition; however, as an anesthesiologist, Intralipid is the “rescue” for local anesthetic systemic toxicity (LAST). Although I’ve never seen this in my practice, it’s important to remain vigilant when performing neuraxial anesthetics (epidurals and spinals) and peripheral nerve blocks. LAST can initially manifest as simple as tinnitus or perioral numbness but progress to complete hemodynamic collapse requiring ACLS and cardiopulmonary bypass. Two mechanisms have been proposed regarding Intralipid’s utility as a treatment for LAST: First, the fatty infusion serves as a “lipid sink” pulling local anesthetic molecules from effector sites (ie, the myocardium) as well as an unbound fraction from the plasma itself. Second, local anesthetics can inhibit the heart’s ability to oxidize free fatty acids to energy. Intralipid can theoretically restore this pathway to promote myocardial activity. In general, whenever I’m using large volumes of local anesthetic or working in an area with high systemic uptake (ie, intercostal nerve blocks), I remind myself where to find Intralipid and how to administer it.